I hope you all had a fun and safe 4th of July! We hosted a neighborhood BBQ yesterday and had an absolute blast. We started off the day at the big community celebration - lots of bounce houses, face painting, cotton candy and then we came home to set up tables and fire up the grill. The kids all swam in the pool, we made S'mores on our little gas fireplace and we ended the evening with a few fireworks out front. My kids all declared it the very best 4th of July they've ever had and I have to agree - it was so much fun visiting with my wonderful friends and neighbors! 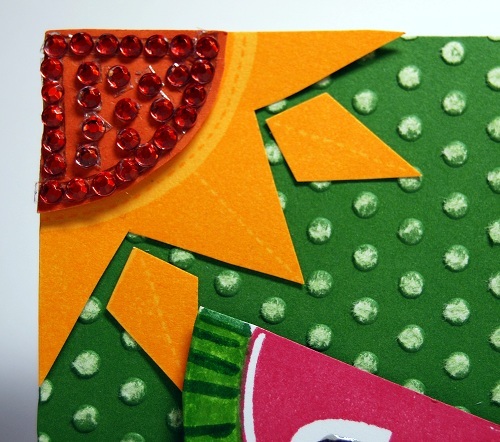 I'm playing along with this week's color combination for the Online Card Class I'm taking. The combo is at the bottom of this post if you'd like to play along! These colors made me think juicy watermelon and bright sunshine! 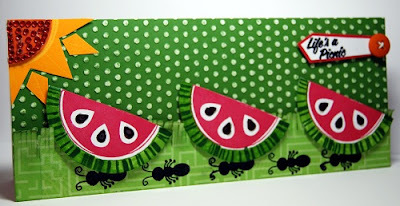 I started with the watermelon stamp (the rind is stamped in Topiary ink with Pear marker over top for the two color tones) which then made me think how funny it would be to have a row of ants walking off with the watermelon. Thankfully we DIDN'T have ants at our big 4th of July BBQ yesterday! I paper pieced the sun and then added some clear rhinestones on top - I colored them orange with a Sharpie. Love it! I am from the south and we love our watermelon :-) Your colors are perfect for this week. Such sweet stamps! Paige, I had to laugh when I saw your card. Years ago, I lived in a small trailer home (we all gotta start somewhere right? ), and we had issues with carpenter ants. I made a home-made chocolate cake one night, and took it to the Lions Club where I used to volunteer for events. We had leftovers, and since we got home really late that night, I left my cake on the counter. When we got up in the morning, we discovered that the ants were having a picnic with the cake, and right next to the cake was a newspaper article with a headline that read "FREE FOR ALL". Hahahahaha. Goodness, didn't know ants could read. So, your card made me laugh right down to my toes all over again. TFS! 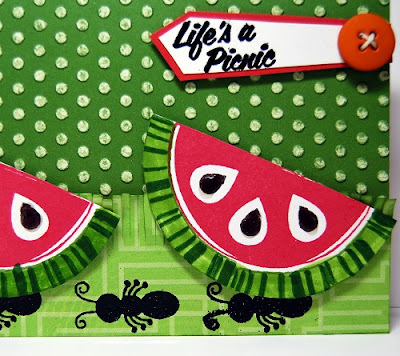 What a cute card, great use of this week's colors and so whimsical.